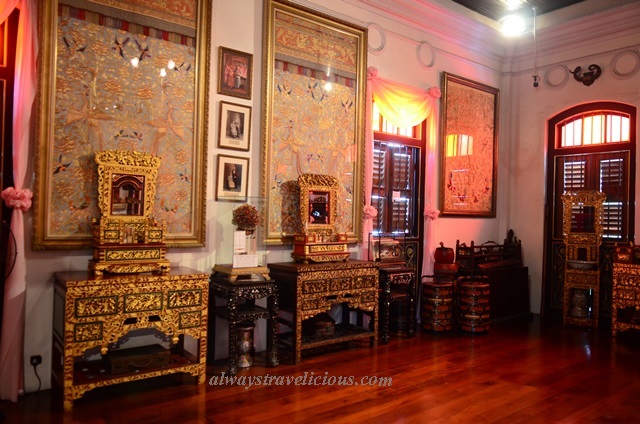 Peranakan Mansion @ Penang - Always Travelicious ! 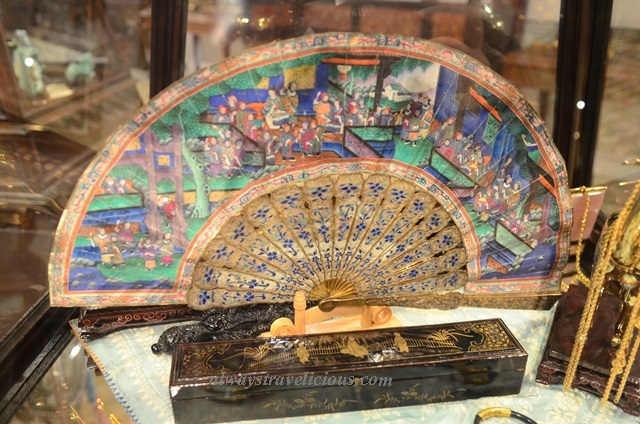 The Peranakan or Baba Nyonya culture is a fascinating culture that is unique to Malaysia, Singapore and Indonesia. 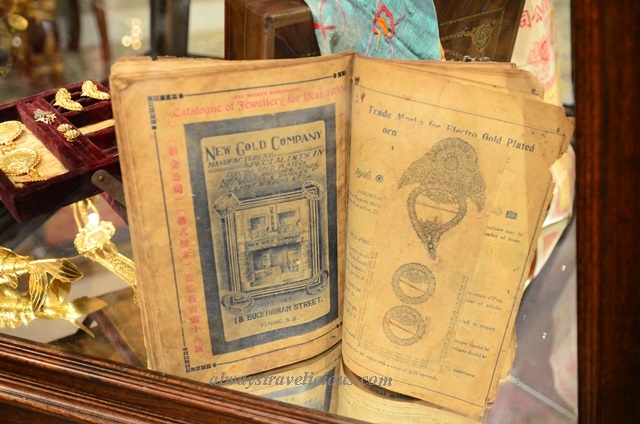 During the 15th and 16th century, when men from China sailed across the ocean to South East Asia seeking for a better life, they married local women and also amalgamated Malayan and Chinese culture. 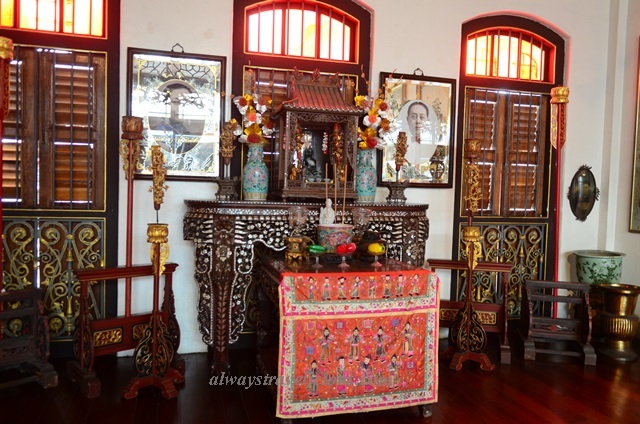 The descendants are referred to as “Peranakans” or Baba Nyonyas. 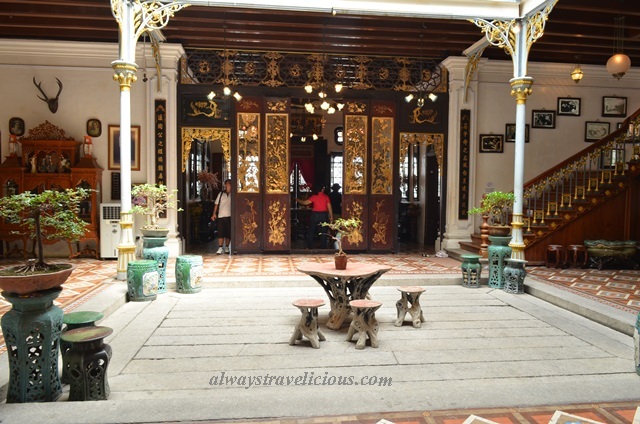 The Peranakan Mansion in Penang was built by Kapitan Cina (or Chinese Captain) Chung Keng Kwee, a wealthy Chinese man who had made his name through tin & mining business and his leadership position in the Hai San secret society. The placard on the house says “海记栈” (“hai ji zhan”), meaning “Sea Remembrance Store”, which was the captain’s working and living quarters. 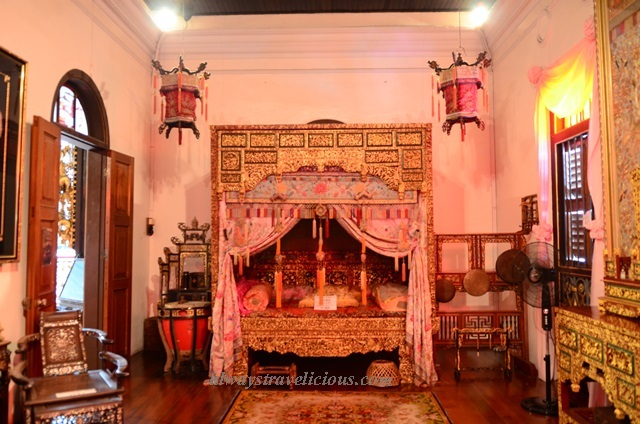 The mansion on top of its vast amount of artifacts and unparalleled architecture, it truly depicts the household of Baba Nyonyas, making it a popular movie set, appearing in many Malaysian and Singaporean TV drama shows. Upon entering the mansion is an impressive center sky well, a common feature in many prewar houses though most of them are located along corridors and none as grand as this one. 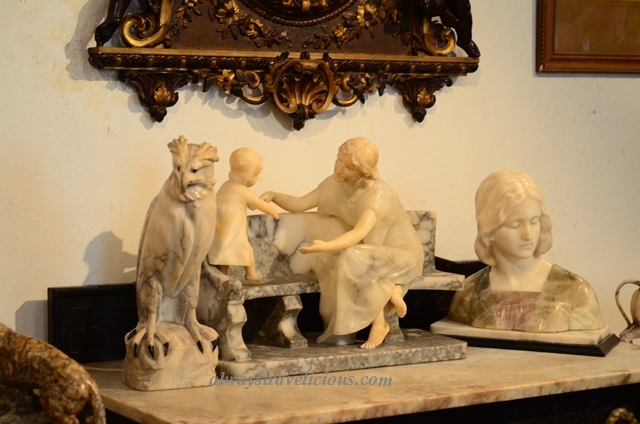 The mansion has two floors, with dining rooms, meeting rooms and game rooms located on the ground floor. 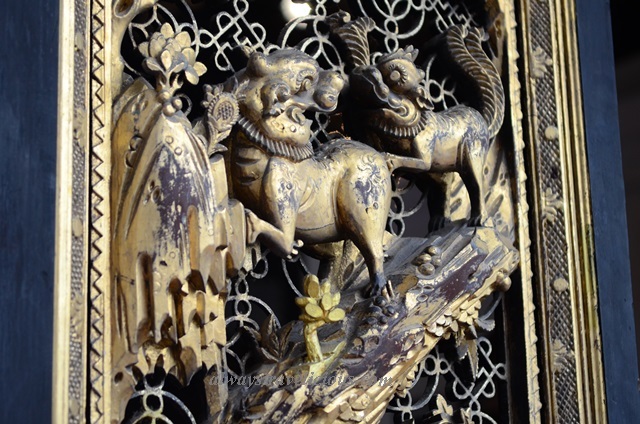 The first dining room is majestic with long tables and intricate golden wood works everywhere. 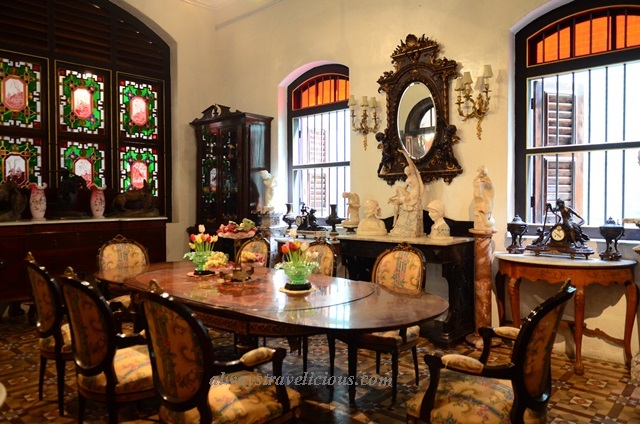 The second dining room is a little more cozy and it’s eclectic with a little bit of everything – European furnitures / sculptures, Chinese windows and brilliant exotic floor tiles. The games room still has cards scattered on the table. Some of the rooms still have photos of previous late owners (?) hanging around which made it just a tad eery for me. 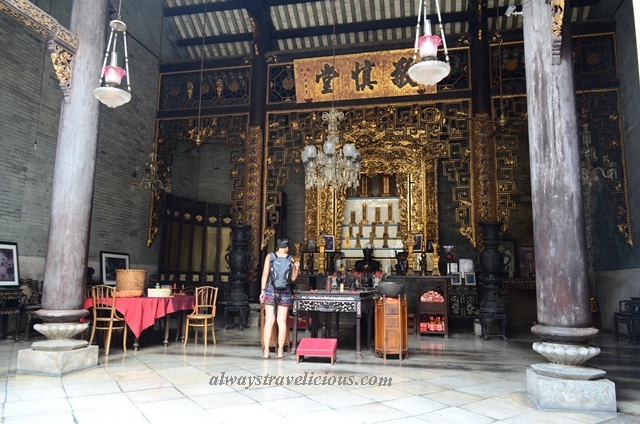 The first floor is the living quarters with a living room, bridal room, bed room and a treasure hall, bright with natural light shining through the central sky well. The living room area on the first floor. 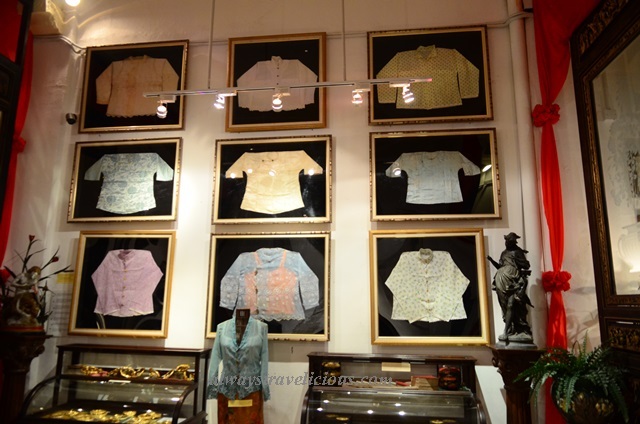 One of the rooms with vintage wedding dresses and cupboards full of nyonya dresses. 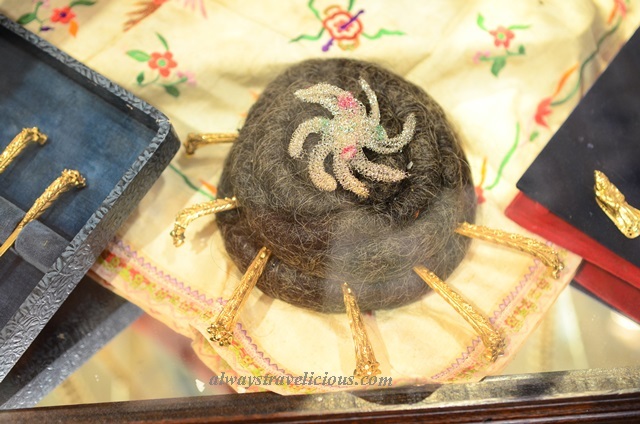 There could never be enough shoes in a woman’s wardrobe, likewise in a Peranakan household with many handcrafted delicate slippers with beads and embroidery. 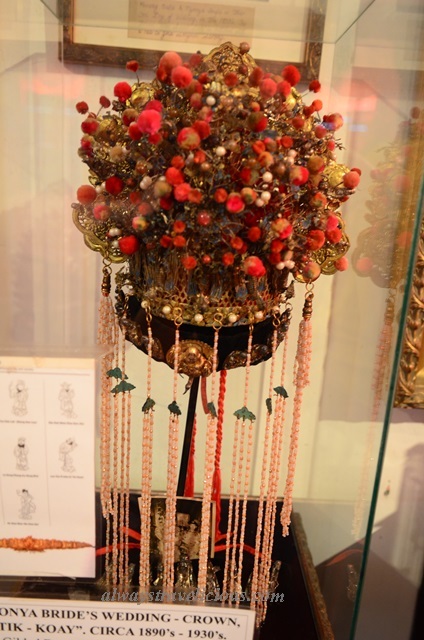 The bridal chamber is illuminated in red, due to the red windows – perhaps to accentuate the auspiciousness of a wedding? 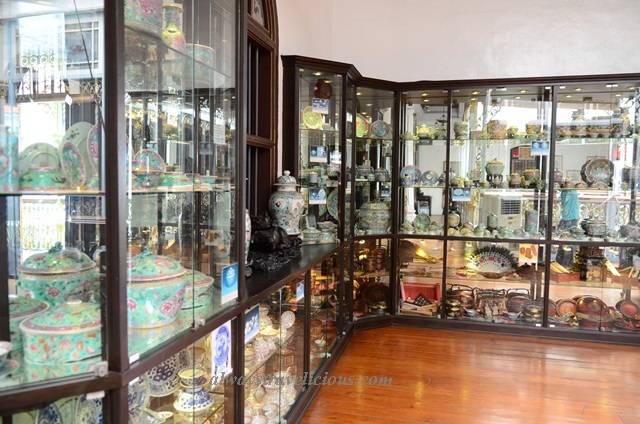 The Treasure Hall houses glassware and ceramics. 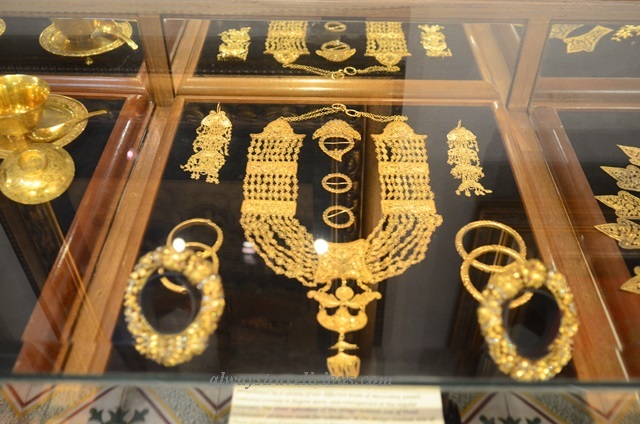 Some treasures are more European as the period of British colonization had had influence on the lifestyles of Baba & Nyonyas. 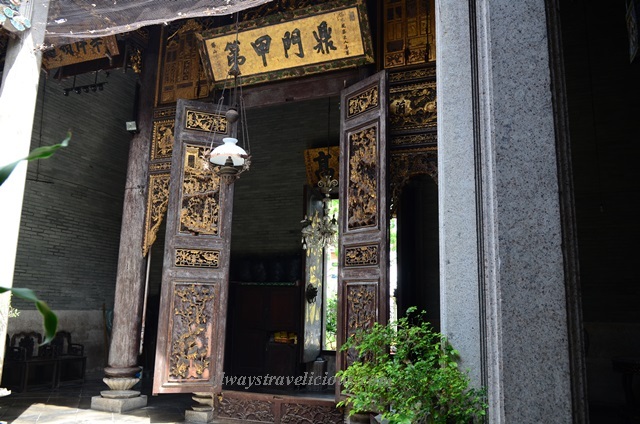 The ancestral tablets are worshiped in a separate compound adjoined to the mansion. 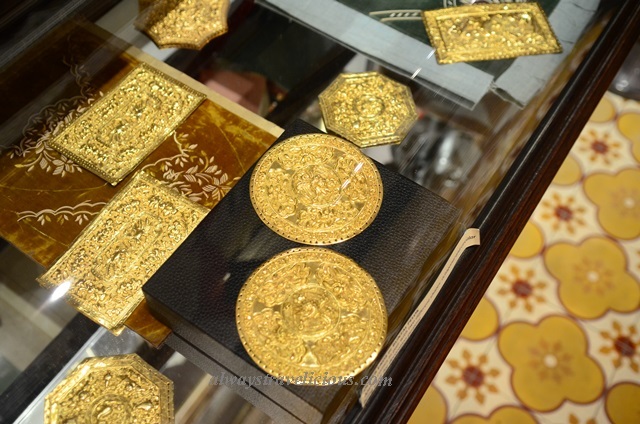 The altar too is opulent in gold, where the luxurious lifestyle runs uninterrupted into life after death. 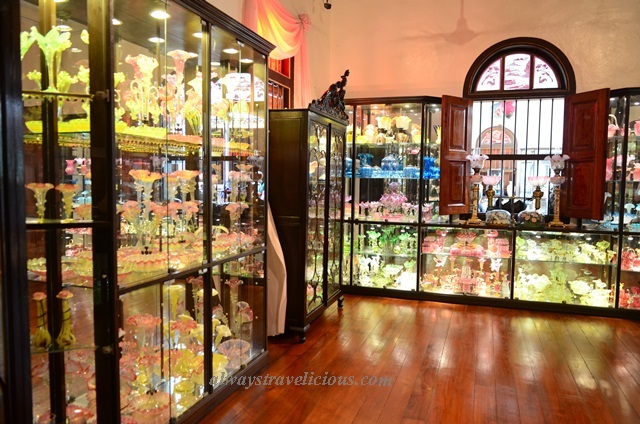 At the end of your visit in the Peranakan Mansion, do check out the back of the mansion as the Straits Chinese Jewelry Museum is located there. 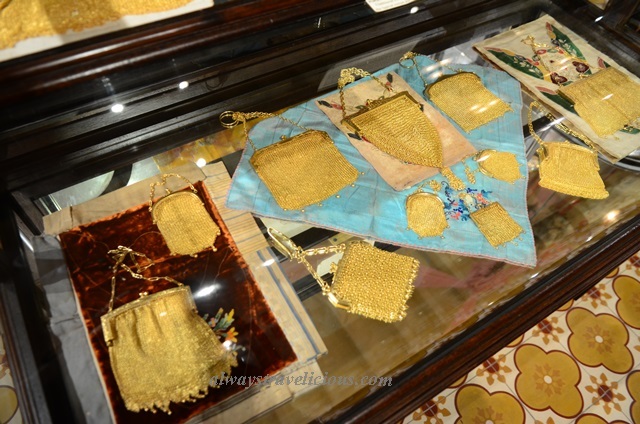 Part of the museum reenacts a gold smith’s shop from the bygone time. 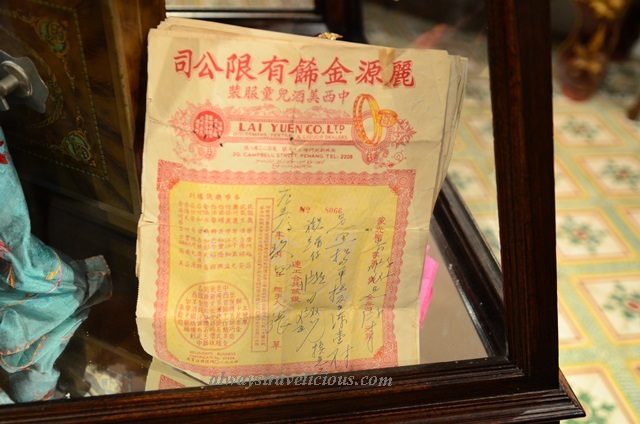 Some documents survived from that period of time too. or gigantic bracelets that are the size of door knockers, or enormous belts that could have been made for boxing champions. 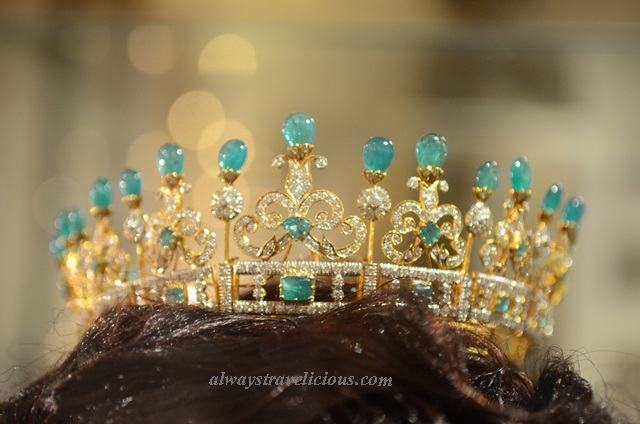 Diamonds and jewels are not uncommon. 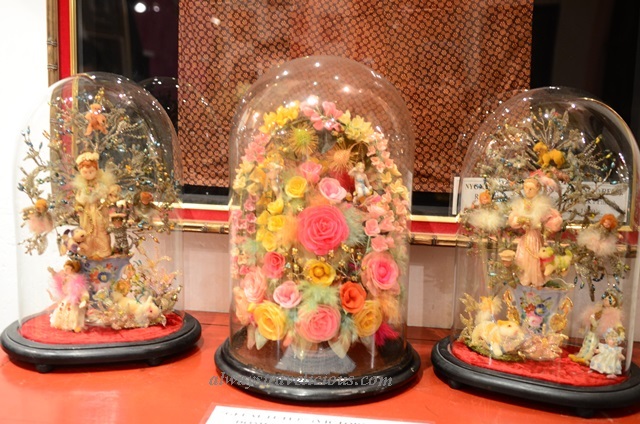 “Gelati Tutup” or Victorian Glass Domes were imported items from Germany, often displayed in living halls or bridal chamber. 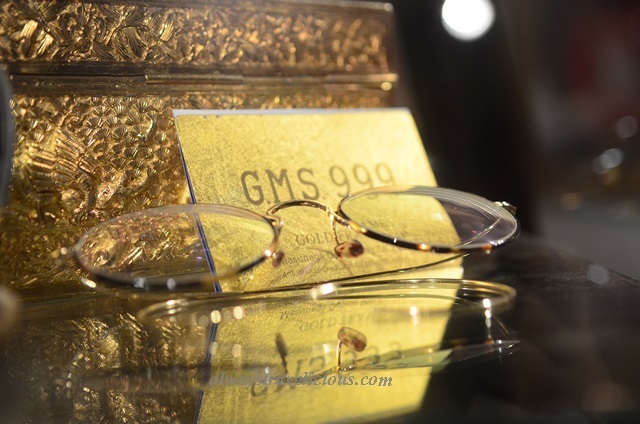 Opening Hours : Daily 9.30 am – 5 pm. Admission Fee : RM 20 per person. 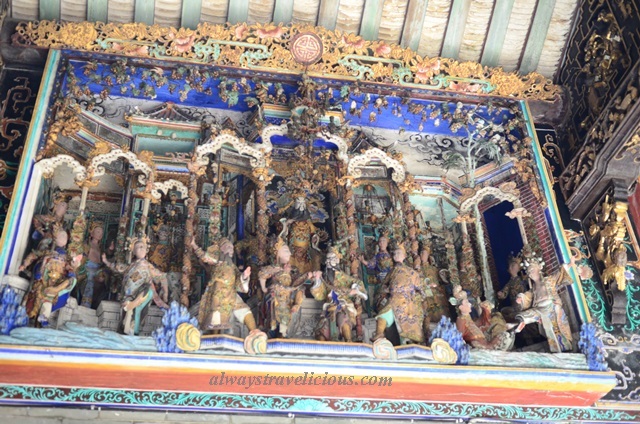 I actually visited this place after a few years living in Penang… ! 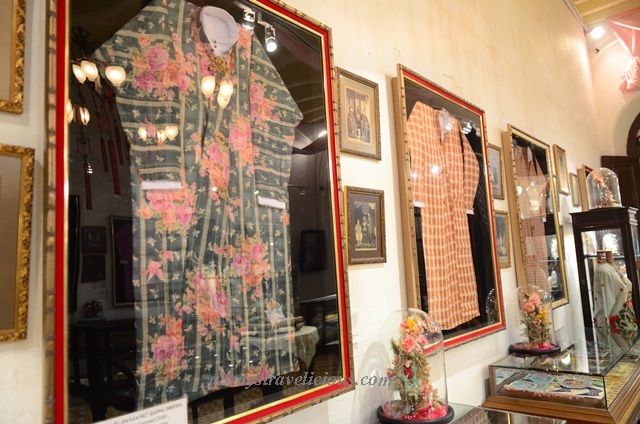 haha ya… photos and clothing of dead people hanging around..
Pingback: Peranakan Museum @ Singapore | Always Travelicious ! 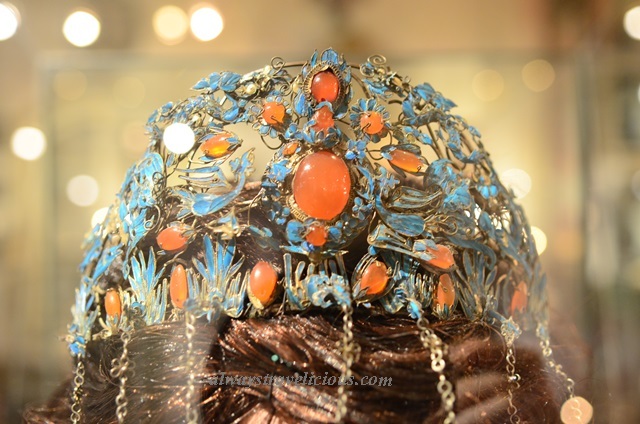 do i need to make prior arrangement for leisure visit? No need. Just go as you wish according to their opening hours. did you get special permission? 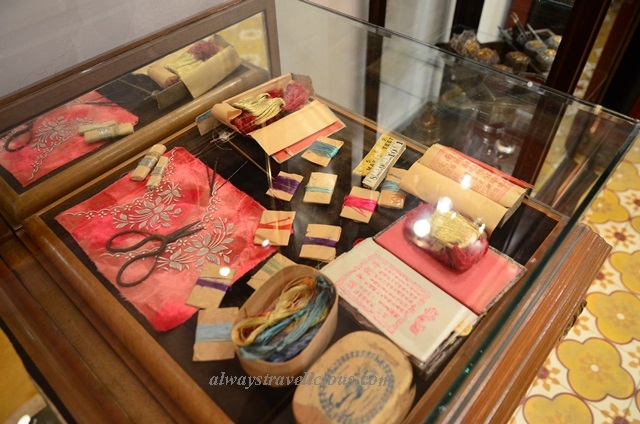 Good article about the Peranakan heritage. 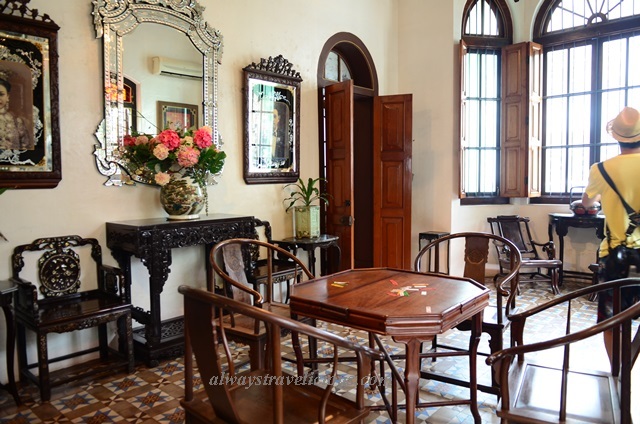 If you ever come to Penang, Chulia Court The Tavern is one of the best adaptations of a Peranakan heritage shop-house for a restaurant, music bar and boutique guesthouse in the heart of Unesco World Heritage City of Georgetown Penang. We have 12 guest rooms with ensuite bathrooms as well as a mixed dormitory with 21 beds are tastefully furnished and affordable. 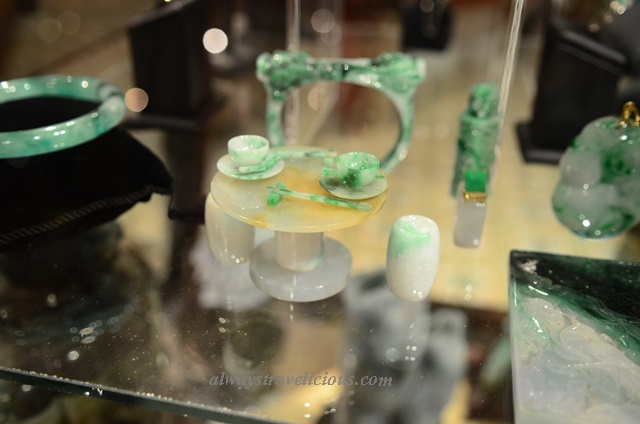 Please have a look at our website, and we would love to have you with us in your next visit to Penang.